NASCAR Heat 3 is the sequel to NASCAR Heat 2, with industry leading developer Monster Games returning to the helm. NASCAR Heat 3 boasts a variety of new features, including a deeper career mode, additional race tracks, expanded online multiplayer features including online tournaments, and a brand-new fantasy dirt-racing experience: the Xtreme Dirt Tour. The Xtreme Dirt Tour in NASCAR Heat 3 allows players to compete across eight new dirt tracks. After finding small town success, players will experience authentic NASCAR racing as they build a career in the NASCAR Camping World Truck Series, NASCAR Xfinity Series, and Monster Energy NASCAR Cup Series alongside the biggest names in motorsports. Players will also be able to manage their own race teams as team owners in NASCAR Heat 3. 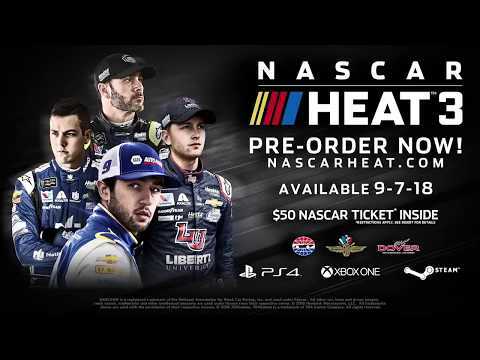 NASCAR Heat 3 was released on PC, PS4 and Xbox One 223d ago in the US and the UK. Notify me when NASCAR Heat 3 is available.